Mahindra XUV500 vs Jeep Compass Detailed Comparison For SUV Fans! 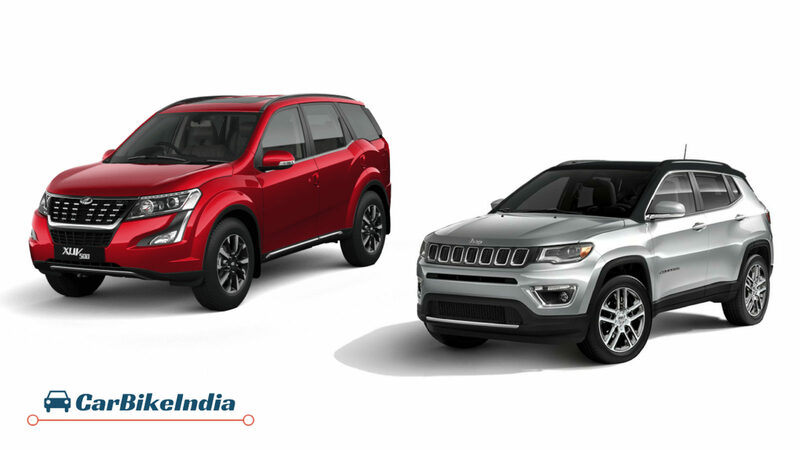 Compare here the two popular SUVs, Mahindra XUV500 and Jeep Compass. Jeep started off its Indian journey with two big, large and premium SUVs – Grand Cherokee and Wrangler – which were certainly meant to pull in big numbers. For that, they needed something volume centric which was big on style and luxury but was certainly made for masses. Needless to say, to make their presence felt by other competitors, they came up with the Compass, which thanks to its incredible price-to-package ratio, became an instant hit. The speed with which it has been climbing the ladders of success is commendable, giving all of its similarly priced rivals sleepless nights. One such rival is Mahindra XUV500, which is evenly matched to Compass when it comes to pricing. However, both the vehicles are poles apart from each other. So, how do they fare against each other? Let’s find out. Both the XUV500 and Compass became instant hits the moment they hit the showroom floors, and a big credit goes to the way they look. The XUV500 has been recently given a makeover, so it’s safe to say that it looks fresher than before with that redesigned front grille, new alloy wheels and completely revamped rear profile with new wraparound tail lamps and tailgate. On the other hand, the Jeep Compass, thanks to its styling elements borrowed from its elder brother Grand Cherokee, manages to look large and premium, even after being a compact SUV. In essence, both the SUVs manage to look handsome, but it is definitely the Compass which looks fresher and bolder out of the two. However, it is the XUV500 which commands more street presence, thanks to its larger size. When it comes to interiors, things become a bit clearer. The interior cabin layout of the XUV500, even after being a seven year old space, manages to look upmarket and more premium than before, thanks to new choice of materials like tan and black leather upholstery, soft touch dashboard and piano black inserts on center console. And when it comes to features, Mahindra has been too generous by loading the XUV500 with some really nice features which were available only in German luxury SUVs before. On the other hand, the cabin of the Compass looks a bit simpler and subtler in comparison, but then, the overall layout and fit and finish is top notch in terms of quality. Like the XUV500, the Compass too comes with features enough to justify its price. However, thanks to its seven seat layout, the XUV500 is more spacious and more accommodating of the two. In terms of features too, the XUV500’s list is longer in comparison. As mentioned earlier, the XUV500 is a full size 7-seater SUV, whereas, the Compass is a compact 5-seater SUV. Needless to say, in terms of size, the XUV500 outclasses the Compass in almost every dimension, and is clearly the more spacious option out of the two. Mahindra has kept its trust on the familiar 2.2 liter turbocharged diesel engine with which the XUV500 has been drawing its power from day one seven years ago. However, the engine has been retuned to develop better performance this time, which stands at 155PS of maximum power and 360Nm of maximum torque. On the other hand, the Compass comes with an all new 2.0 liter turbocharged Multijet diesel engine, which churns out 173PS of power and 350Nm of torque. This time around, the XUV500 is being offered with a choice of a 2.2 liter turbocharged petrol engine, which develops 140PS of power and 320Nm of torque, whereas, the Compass has a much smaller but much powerful 1.4 liter turbocharged petrol engine, which develops considerably better performance numbers, which stand at 163PS of power and 260Nm of torque. Here again, the Compass emerges out as a better performer out of the two. Both the cars are being offered with automatic gearbox as standard. Since both of them are premium SUVs, so it’s safer to say that both these SUVs come equipped with top-notch safety features, with the Jeep inching ahead the XUV500 with a very thin margin in this department. The Mahindra XUV500 comes fitted with McPherson Type with Anti-roll Bar at front and Multilink Type with Anti-roll Bar at the rear, whereas the Jeep Compass comes with McPherson strut with lower control arm disc at the front and Multilink suspension with strut assembly at the rear. In comparison, it is the Compass’s overall ride and handling setup and ride quality which feels more reassuring out of the two. The Jeep Compass emerged out as a surprise package when it was launched, thanks to the fantastic price and package ratio it offers. It offers everything which a compact entry level SUV from a premium luxury car maker should offer, making it a worthy package. However, when compared to the XUV500, it definitely doesn’t appears as a value for money package, as the Mahindra offers almost similar levels of equipment and performance at a much lesser price point. But then, there comes this ‘brand quotient’ which irons out the differences. The Compass offers you the brand nameplate which can make you feel special. So, if you are out in the market for an SUV in this price range, go for Compass if you want to get the ticket to the list of big brand names. However, if you are one of those people who put value for money over every other aspect, the XUV500 makes a stronger case for itself.